If you could visit the past, whom would you have lunch with? So I thought I’d answer it, once and for all. If I could time travel, I wouldn’t waste it on the past. I’d go forward. I’ve lived through a few decades of the past—I know what it’s like to get by without running hot water and electric knives and cellphones. And I’ve read enough about the days before plumbing and the zipper. I’d like to know what becomes of women’s marches and noise-cancelling headphones. I’d love to go away for a while and rest, and then come back and talk to the grandchildren of the Millennials. That would put us at around 2060. 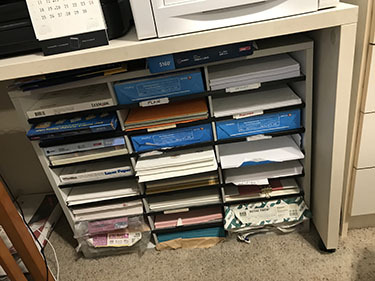 PAPER, in widespread use in 2018 a.d.
1. What’s the official language of the United States? 2. Does Safeway still have two aisles of pet food and only half an aisle of cheese? 3. Did Jennifer Lawrence’s face ever wrinkle? 4. Does anyone use paper anymore? For what? 5. Did anyone stop the rain? 6. Did we ever give peace a chance? I love the way you think. Since it is time travel, does that mean that maybe we can come back in time to the present and tweek what we are doing? Will I ever catch up on my TBR list?